Luang poo Yiam or Jow Koon Dtow is a very famous monk in Thailand, especially to those who like to collect his Kreung Rahng(magical items) and rian amulets. Luang Por Yiam's rians are the top amulet in the series of BenJaPahKeeRian; the Great Five Rians. Luang Poo Yiam was borned in Bangkok on the 5th August BE2375, during the 3rd King Regime. At the age of 9, Luang Poo Yiam began his formal studies at Wat Nang. Later, when he was 11 years old, Luang Poo Yiam went to study at Wat Bowan, and after sometime, he moved to Wat RahtBurRaNa to continue his studies. At the age of 19, Luang Poo Yiam was ordained as a novice at Wat Nang for a short period. When Luang Poo Yiam was 22 years old, he became a monk at Wat RahtOhRaSahRahm, and his preceptor was Pra SutTuMaTeRa(Gert). Pra TamMaJaDee(Jeen) and Pra Ah Jahn Rort, Wat Nang Norng were his Dhamma teachers. 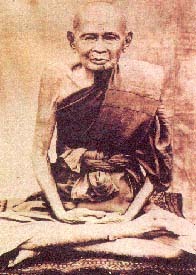 Later on, Luang Poo Yiam also studied Dhamma under Pra PahWaNahGohSon(Rort), Pra TamMaJaDee and Pra SangWonWeMon(Men). Luang Poo Yiam was a very hard-working monk, and very soon he was promoted to Pra BaiKiGah(monk title) and subsequently became Pra PaLatTahNuKrom(monk title). When Luang Poo Yiam reached 16th PanSah(rain retreat), the 5th King bestowed the title of Pra Kru to Luang Poo Yiam. Luang Poo Yiam returned to Wat Nang and became the abbot of Wat Nang. In BE2442, Luang Poo Yiam attained the title Pra RahChahKaNa. Luang Poo Yiam remained in Wat Nang for 27 years, until he passed away at the age of 94, on 29th April BE2469. Luang Poo Yiam has never felt arrogant due to the attention and his popularity, instead he always mentioned that he was just an ordinary monk, and was not as good as any of his teachers who had taught him Dhamma.